An established favourite, widely trusted by climbers worldwide, DMM's classic set of wires is at the heart of a good rack. Sculpted with scoops and curves to account for shallow or awkward placements, Wallnuts are easy to place and offer a secure hold in a wide range of crack configurations. Also engineered into the design is DMM's lightweight construction, so you're not having to haul heavy ironmongery around with you, but this is of course never at the expense of strength and security. 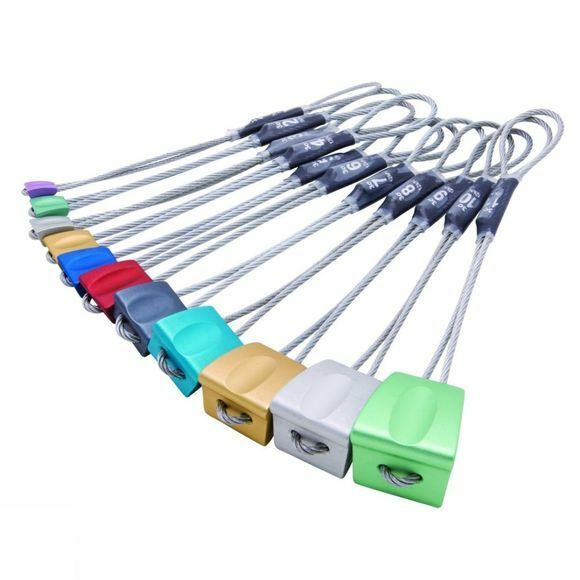 The clear colour coding allows for quick and easy selection and is right there in the metalwork - not just the swage - and is compatible with other nut brands so you can safely mix and match. Quick selection, easy placement, light weight, bomber holding power: what else could you ask for in a rack of wires?